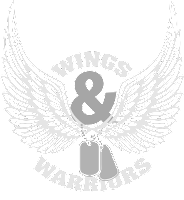 Wings and Warriors is a charitable foundation 501(c)3 that provides service dogs and training to military veterans and others who have been diagnosed with PTSD (post traumatic stress disorder) and TBI (traumatic brain injury). We adopt and train dogs from shelters or rescue groups. By doing this, the service dog gets a chance at a new productive life filled with love and purpose. WE ARE FUNDED SOLELY BY CHARITABLE GIVING. Training and boarding service dogs costs approximately $15,000 each, depending on the needs of the dog and the length of time to train. These dogs are then donated to service veterans at no cost to them. Your donations will allow us to provide the best and most comprehensive training needed so that our returning veterans will have a companion and friend for life! Wings and Warriors wants to help! Please help us “save lives one step at a time”. and TBI (traumatic brain injury)." Copyright Wings-and-Warriors 2017. Picture Window theme. Theme images by AndrzejStajer. Powered by Blogger.